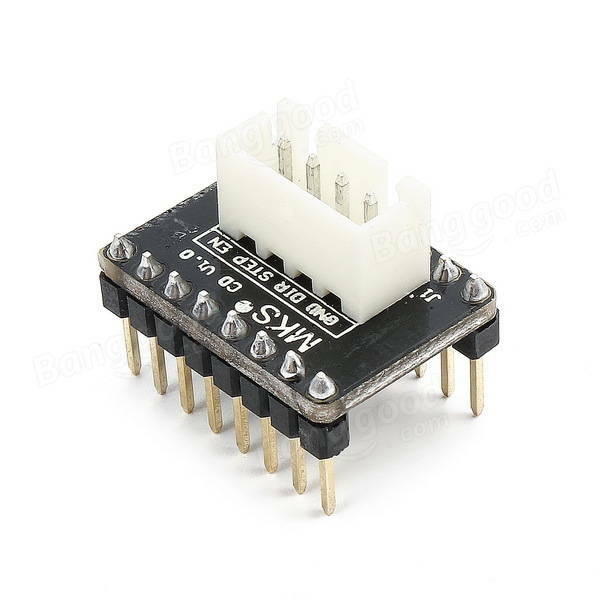 In current 42 motor-driver of 3D printer on the market is that the direct primary IC connect to motor driver IC, the current consumed by each interface will not exceed 2MA. The MKS Gen motherboard that we design has signal port, which can output the signal from motor driver. We suggest using 4988, 8825 etc. motor driver. Generally, what 57/86 stepper driver inputs, is the optical coupling isolation, mainly to prevent from interference. Each motor driver has 3 inputs. EN enable port controls motor switch. PUL pulse port controls the movement of the motor position or speed, DIR direction interface controls movement direction of the motor. The driver current of general optical coupling interfaces is around 10MA, one driver actuates one motor. One driver consumes most of 30MA control current, after X, Y, Z, E connect to four general 57/86 motor driver that will need 100MA current at work . It is easy to burn the 3Dprinter IC control board if build connection directly but for not enlarge current. MKS CD expansion board can adjust the flow control signal, to avoid motor drive with optical isolation generate press on main IC, therefore, Ramps1.4, MKS Gen and other main board with five large motor drive can operate completely without pressure. Insert MKS CD directly into the driver slot, leads the control signal from the above white card port. Please note the direction of the socket.